I am sure at some point of WordPress Blogging you would like to install WordPress on localhost or your PC. This is perfectly good to make your small improvements or changes without looking for some wordpress developers. Installing WordPress locally (or localhost) is the foolproof way to make and test changes. Today we will discuss how to install WordPress on your Windows based PC or Laptop. What we gonna need to install WordPress on our localhost? If you see the requirements for WordPress. I am sure you have seen that we need basically a web-server (like Apache or Nginx) with a database (like MySQL) and of course PHP5. The trick here is to install the whole bunch of software at once. XAMPP will do all the magic we want. This will easily install and configure Apache, MySQL and PHP at once. There are a few more things in XAMPP installation file. But, we do not need them here. TIP: Download XAMPP having highest version number. e.g. if XAMPP 1.8.2 and 1.8.3 both available, then download 1.8.3. XAMPP is a cross-platform software and also available for Linux and OS X. But right now I will demonstrate on on Win7 PC. a) Download and Install XAMPP: Download XAMPP from ApacheFriends (the official site) and install to your system. I would recommend you to install the latest available version. The process will be simple. b) Turn on your local server: Turn on Apache Webserver and MySQL Database server from XAMPP. 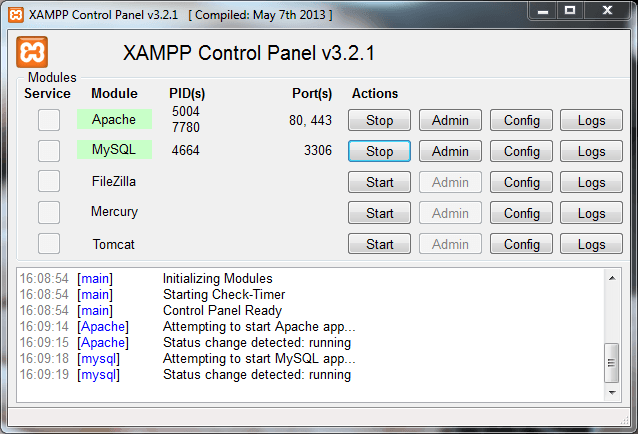 To start servers go to Start >> XAMPP Control Panel >> Hit “Start” button in front of “Apache” and “MySQL”. Once the servers start you a green background with PIDs and Port Info will appear (like the screenshot below)You may check your server status by visiting http://localhost/ or http://127.0.0.1/. c) Create Database: Now we will have to create a MySQL database for WordPress. 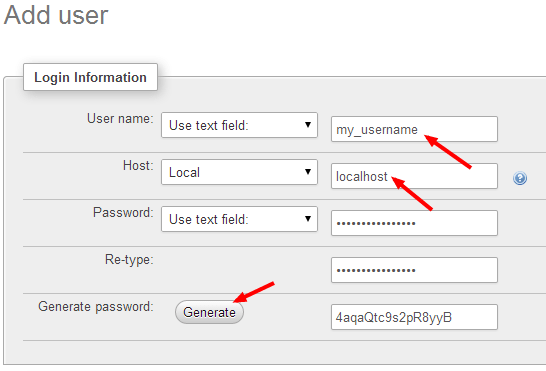 You may use the PHPMyAdmin to do it graphically. Simply visit http://localhost/phpmyadmin/ from your browser. Find the database on left panel and click it, Now click “Privilege” on the top navigation. a) Download and move wordpress files to correct directory: Download the latest version of WordPress and place the unzipped/uncompressed files to the directory htdocs (you will find htdocs in XAMPP installation directory. If you put the wordpress files in a directory called wordpress in htdocs then your wordpress site url will be http://localhost/wordpress/ (by default). WordPress Installation: I am pretty sure that you already knew about WordPress installation. If you are familiar with famous 5 minutes installation of WordPress then you may go ahead and start doing yourself. Click “Lets Go” button on the next page. Database host: localhost <– This will not change in your case too. Now hit “Install WordPress”. If everything gone right (and I am pretty sure it will) you will get “Success” message. Congratulations, Your WordPress is now installed on localhost and you may now login. Check this video if anything unclear in installing WordPress. You may also leave a comment below for any help. So far every wordpress installation procedure is pretty much the same, but they all stop right where I have my problem! I can access my new site with http://localhost/wp-site/wordpress, but I want to access it with http://localhost because that is where my domain name sends incoming traffic. When I navigate there I get the XAMPP start page. I have gotten myself so confused. Is there a way to make wordpress work as just plain ‘localhost’ or do I have to go back to Microsoft IIS and write my own html code? ?